Whitechapel Gallery’s new archive-based exhibition recognises and celebrates a selection of London’s most iconic LGBTQ+ venues with extensive archival material and artwork displayed. 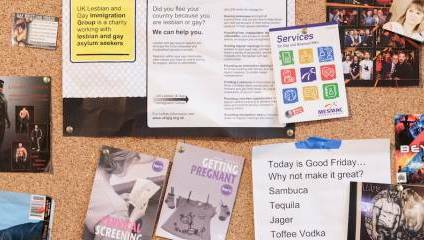 In just the ten years between 2006 and 2016, over 50% of London’s queer venues were closed, including the First Out Café, Camden’s Black Cap pub and the London Lesbian and Gay Centre, all of which are paid homage in the exhibition. The exhibition focuses mostly on the archival material relating to the venues; leaflets, planning applications, letters all come together to paint a picture of these lost spaces, particularly relating to their respective closures and the reasons behind them. While the documents are illuminating, and one can spend a while poring over them; the opportunity could have been taken to bring the venues to life in all their vivid colour with photos, video and perhaps more personal testimonial. A rainbow flag taken from The Joiners Arms nods to this possibility, but not taken further, this feels more like a history lesson than a celebration. The exhibition also features artworks from Tom Burr, Prem Sahib, Ralph Dunn, Evan Ifekoya and Hannah Quinlan & Rosie Hastings, displayed among the archives. The artworks are diverse, from Quinlan & Hastings’ pinboard of various gay print materials and memorabilia, collected from more than 170 gay bars across the U.K, to Dunn’s evocative photographs, desolate yet romantic, of public toilets. Once cruising grounds, they have now been demolished for – of course – luxury flats. This is the same fate of Chariots, the gay sauna from which Sahib took an interior design artefact and reworked it, adding piercing-style features to create a striking piece. Tom burr’s work often focuses on the interaction between the private and the public, and his piece in the Queer Spaces exhibition is thought-provoking and a little interactive, something an exhibition with multiple artists can always do with: a long, low mirror that reveals a dark reflection of your feet and ankles. Despite some evocative pieces, however, the archive – to art ratio is rather skewed. Though the past has been meticulously documented here, the exhibition doesn’t quite bring it back to life.